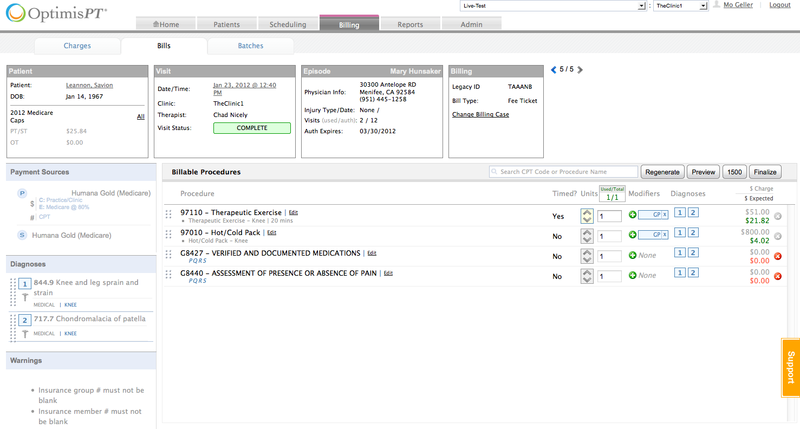 Integrated across all modules, our scheduler ensures efficiency and easy access to patient information whenever and however you need it. 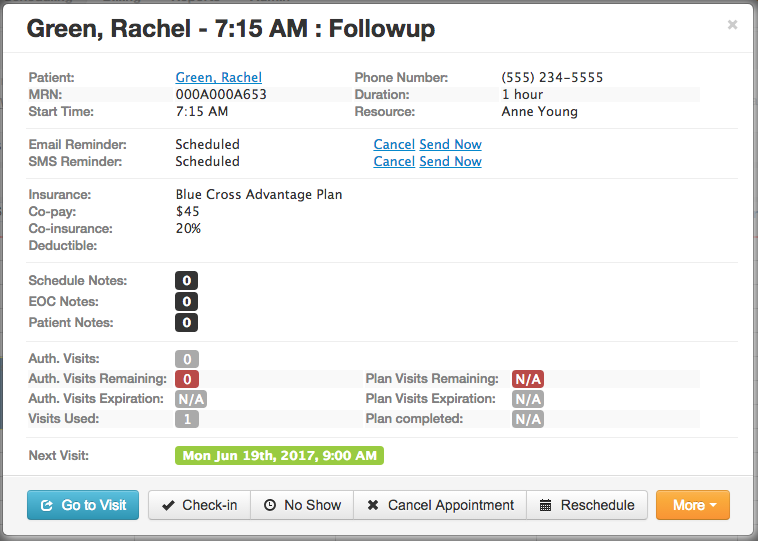 Efficiently schedule a patient appointment and identify any Co-pays that need to be collected with the built-in alerts. Increase internal communication with our Schedule, Episode of Care, and Patient notes. Significantly reduce Cancellations and No Shows with automated appointment text and email reminders. Easily track authorizations and organize your schedule by the payer and visit type using custom schedule categories. 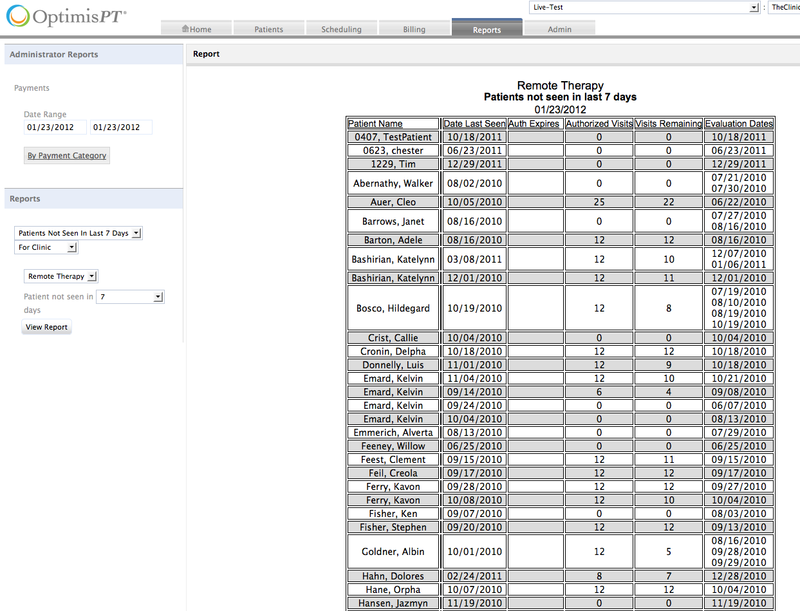 Efficiently create edit and view schedules for patients, providers, treatment rooms, pools, and equipment. A therapist can easily manage their schedule, patient authorizations, task lists, flowsheets, and patient documentation directly from the Home Page. Join an OptimisPT demonstration or contact a OptimisPT representative to discuss billing options. 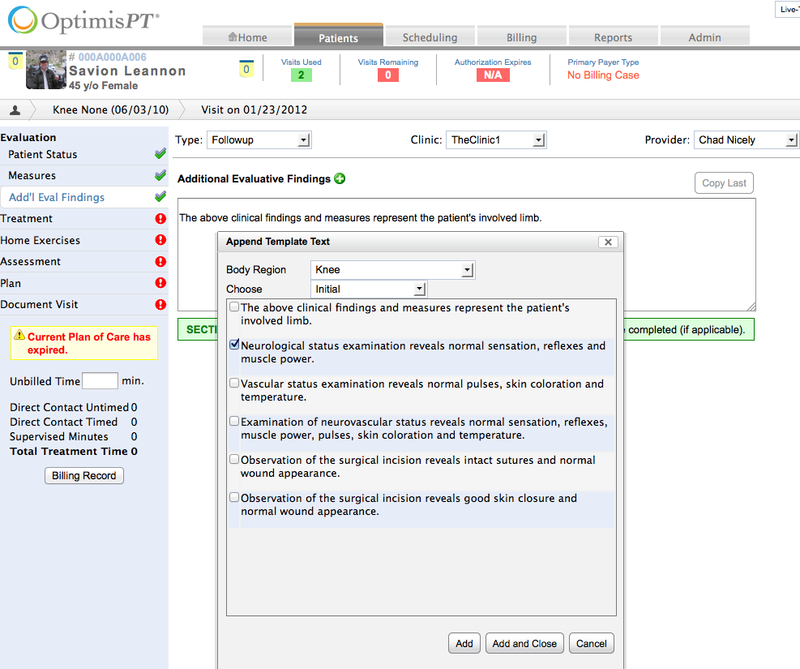 OptimisPT is an EMR and our interface partners help provide the billing component for your practice. The representative can elaborate on pricing associated with the billing software and help coordinate a demonstration or contact with our interface partners. Simplify your day-to-day and long-term billing practices. Successfully process claims for multiple payers and receive payments electronically within days. Keep everyone informed and on the same page with billing profiles. Ensure accurate submissions and streamlined revenue capture. Enhance accuracy in your reporting through clear language and guided support. Generate and submit automated claims backed by science and evidence. OptimisPT is the only evidence-based PT documentation software with built-in clinical decision support and expert coding and compliance guidance available as a physical therapy documentation software to help reduce audit risk for physical therapists. We don’t just meet regulatory requirements; we guide you through them. Improve patient care, documentation, and communication with built-in dynamic Clinical Decision Support at point-of-care. Enjoy embedded alerts, prompts, reminders, and real-time recommendations to facilitate compliant documentation. Use evidence-based practice patterns to assist you in examining patients and documenting the results consistent with professional standards. Access pre-sorted measures based on evidence and clinical research and customized practice patterns that assist with efficient documentation performed at the “point of care” . Reduce risk of punitive audits with our integrated documentation and compliance alerts, designed and constantly updated by national experts Helene Fearon & Steve Levine. Utilize built in prompts and alerts throughout documentation to guide proper coding and billing practices. Seamlessly integrate Medicare documentation requirements for initial evaluations, treatment notes, progress reports, reevaluations, and discharge statements. Ensure optimal compliance through CPT codes that are both captured correctly and appropriately described based on documentation of services. Enhance revenue capture through accurate and necessary data capture and reporting. Manage and share clinical information in multiple report formats that provide necessary/desired information for colleagues, referring physicians, and payers. Develop and utilize customized clinical practice patterns to create consistency and efficiency in data capture, seamlessly populating CPT codes justified by documentation in the medical record. Dynamically calculate Medicare therapy cap limitations and generate CPT codes/modifiers required by payers with built-in notifications. One of the real strengths of OptimisPT is a comprehensive approach to audit protection. Although no one can guarantee that you won’t be audited, our experts have incorporated intelligent alerts, notices, reminders, and practice management reports, currently, designed to identify potential problems before they occur, minimizing the risk of billing for services that are not medically necessary or that are inconsistent with Medicare and other third-party requirements. Retrieve practice management reports by any date range quickly and easily. Access real-time reports for accounting, billing, and general practice management indicators at the push of a button. 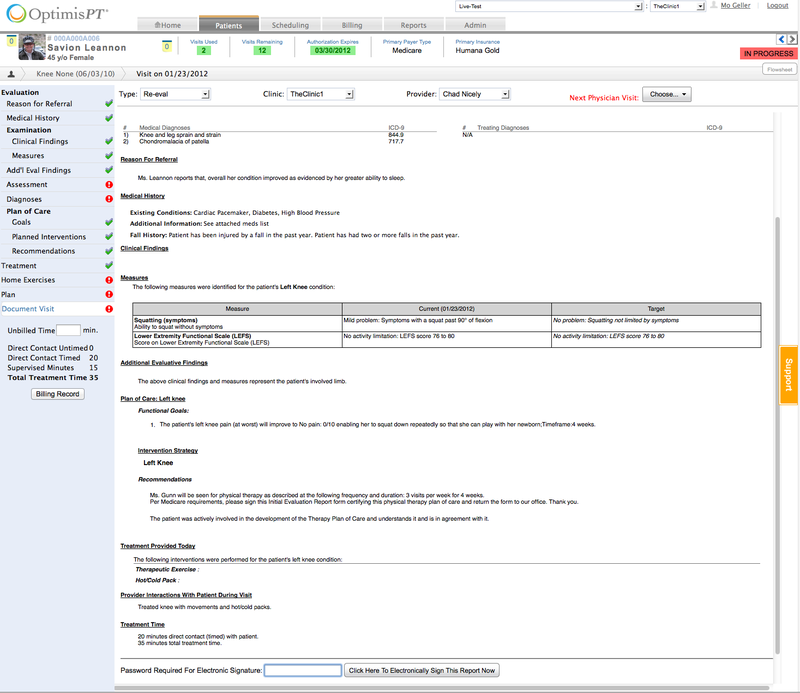 Generate specific report and contract details in any state with any payer type or configuration (from Medicare to Workers Comp, and more). Review valuable data at the touch of a button, such as clinic locations, therapists, payers, referrals. 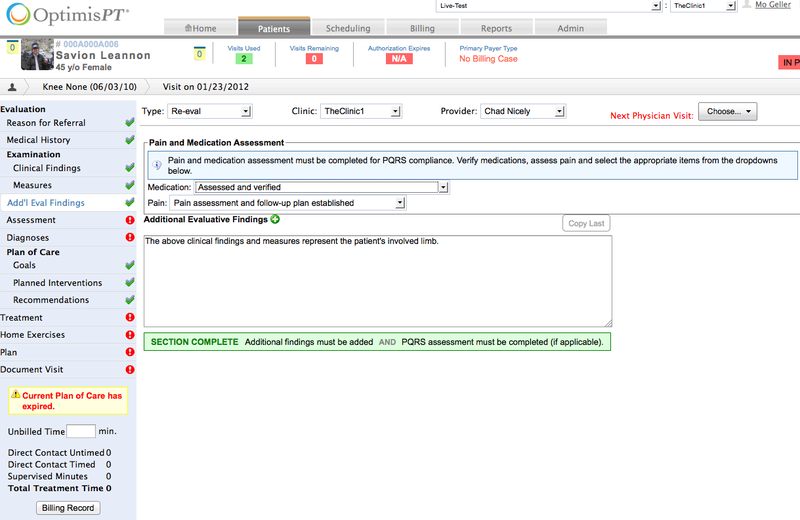 Accurately track cancels, no-shows, other “lost” patients, visit count, revenue analysis, and more. Use built-in intelligent alerts, notices, and reminders to guide best practice decisions. 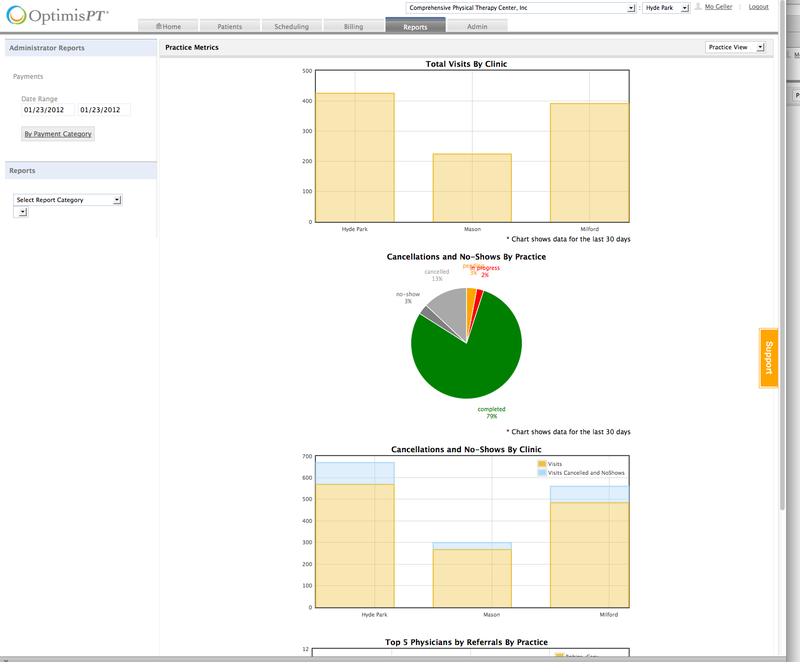 Utilize charts and graphs in your approach to audit protection with built-in intelligent alerts. Maximize efficiency and compliance with our easy-to-use “key indicator” dashboard. Understand overall practice performance and make necessary improvements in “real time”.